RT Grunge - qualitative pattern combines the sophisticated professional design with powerful configuration. June joomla template for free from the studio RocketTheme. 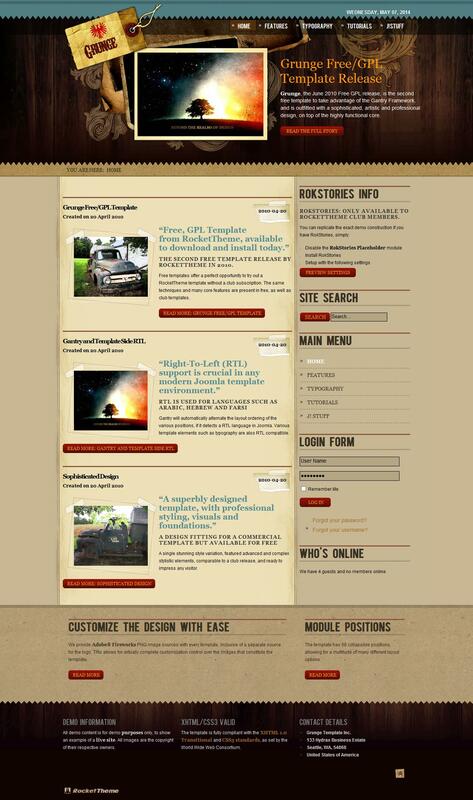 Template made in blogging style, has 68 positions for modules and support RTL \ LTR spelling. The template is based on the framework Gantry. Template made by Gantry Framework, the framework, the corporate studio, so it works quickly and successfully. Pull-down menu, done in CSS, there is a module JComments Styling, supported by IE 6. Speaking of browsers, pattern when testing showed himself perfectly in all modern and popular browsers. In addition, the template code is cleaned and optimized for search engines. This template is suitable for Joomla versions 1.5-2.5 inclusive.